The Nosto Partner Transfer Tool is an exclusive tool built for partners implementing Nosto on several online stores. The tool provides copying functionalities to transfer settings from one Nosto account to another, within just a few clicks! It becomes easy and fast to transfer one or multiple recommendation templates, recommendation slots, behavioral pop-up campaigns, triggered emails or email widgets campaigns from one source account to one or several target account(s). 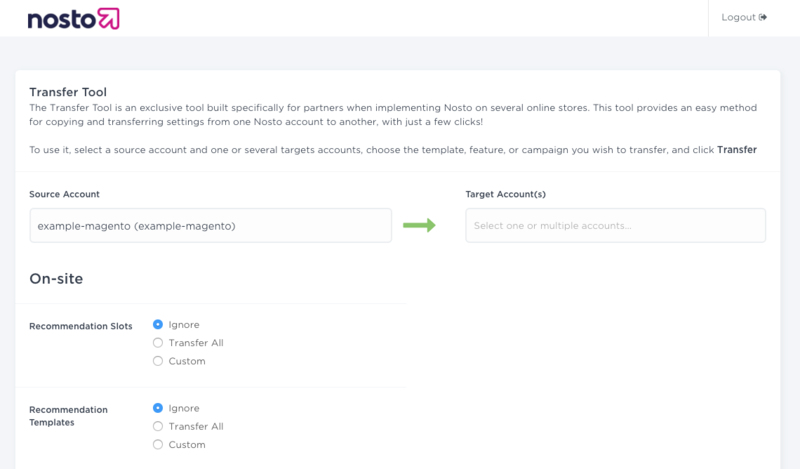 If you want to have access to the Nosto Partner Copy Tool, please contact your Customer Success Manager or our Support Team via support@nosto.com or the live chat in the Nosto Admin Panel.